Guard shacks and lookout towers have been around for centuries. Today, numerous industries require enclosures that can house security personnel and protect sensitive equipment. If your business demands such a building, Panel Built Incorporated offers a large variety of interior and exterior c structures that will fulfill your exact needs. A prefabricated guard shack is the perfect alternative to any conventionally built buildings, saving you both extensive time and money. If you opt to build a freestanding guard shack or gate house the conventional way, it will translate into considerable construction, contractor and labor costs, and a lot of time. We are assuming that when you decide on erecting such an enclosure, you would like it quickly and without the high costs attached. A guard shack enclosure from Panel Built is already preassembled at our factory and can be shipped directly to your site, ready for immediate use. We feature a large variety of both interior and exterior preassembled small building systems, and all are a smart solution to your impending industrial, commercial or military needs. We respect how valuable your time is. That’s why we are proud to complete your order for a prefab guard shack quickly, and we are able to do this because all our structures are already built and can be shipped to you as fast as you need it. When your enclosure is delivered to your site, it will be ready to be used immediately. There is no on-site construction or assembly required, and is ready to plug-in and staff for prompt use. We are proud of our rapid lead times, and our friendly and knowledgeable staff who happily assist you through our simple ordering process. Our buildings are transportable too, able to be fork or crane-lifted onto a truck for quick and easy transport to any other locations on or off your site, without having to be disassembled. All our modular structures are created to provide your employees with a functional space that is both comfortable and safe. All our products are constructed of heavy-duty, high quality steel panels which sit on a powder-coated steel base. Our exterior enclosures come standard with a powder-coated diamond plate floor, a metal door with a half glass and the necessary hardware, as well as a flat roof with a built in gutter system. 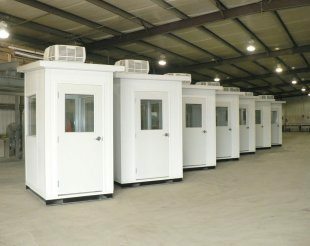 We also offer the best available prefabricated guard booths, that feature a horizontal sliding window, a picture window, a counter top, surface mount fluorescent lighting, and roof mounted HVAC systems. Panel Built is a leader in prefabricated modular building expertise, customer service and value. We build our products according to strict standards. We offer a variety of panel selections and accessories for your structures, and our systems are strong, durable and able to withstand heavy daily use. All our buildings meet rigid building codes. Our portable structures are also attractive and very low maintenance. Using one of our high quality modular buildings is an excellent economical choice, saving you time, money and conventional construction headaches. Our staff is more than happy to listen to your security needs, your space challenges and your time constraints and will help you choose the perfect structure to meet them. We treat all our customers with the kindness, respect and time they deserve, as we know that your complete satisfaction is the key to our continuing success. Our one and only goal is to help you meet your structure goals and do it with a smile. We invite you to browse our website for all our security booth products, and read more about Panel Built, the huge variety of structures we manufacture, and our seriously competitive pricing. Our current clients consider us their modular building solution experts, and we will do everything we can to prove this to you, too.